We do indeed! Click here to order. Also, we encourage you to sign up for our mailing list so that you will be among the first to know about special offers, promotions and new flavors! Have questions about shipping? Call our shipping team at 912-483-0126. We ship our super-premium ice cream in Styrofoam coolers with blocks of dry ice. We require a minimum of four pints but can ship as many above that as you would like. We ship with enough dry ice to last until the evening of your order’s scheduled delivery. Click here for more information. Where in Savannah are you located? Our flagship shop is located in the heart of downtown, just steps from the River and next door to the large vertical SCAD sign on East Broughton near Abercorn Street. Our address is 212 East Broughton Street. We have two exciting new locations in the Savannah/Hilton Head International Airport. A kiosk, past security on the concourse and a full-service shop in the Savannah Square before TSA security. At the kiosk, we offer a selection of our classic and seasonal flavors. At the shop, we have a semi-full soda fountain with old-fashioned soda fountain treats like milkshakes, malts, sundaes and banana splits! There’s plenty of parking at the airport and we always validate for Leopold’s customers! Where else can I find Leopold’s Ice Cream? We currently partner with a very select group of Savannah’s finest restaurants and shops to serve some of our classic and custom flavors. We recently expanded our reach with a partnership in Florida. We look forward to more of these wonderful partnerships in the near future! Yes we are! Though our hours of operation may vary, Leopold’s, like Savannah, never has an “off season” and proudly serves up tasty memories year round. What makes your ice cream so popular? Each and every Leopold’s guest could probably give you a different reason for why they come back to see us whenever possible. From our friendly staff and nostalgic atmosphere to our high quality, homemade menu items. If we had to pick just one thing that really sets us apart, it’s that our recipes have remained unchanged for over 96 years. We still carefully hand-craft each batch of ice cream the same way the Leopold Brothers did when they opened our store in 1919! Can you cater my wedding, office party or special event? Yes! Near or far, we can provide an ice cream experience like no other. We sprinkle a little fun into any special event. For full details on our catering services, click here. Does Stratton still work in the movie business? Yes he does. Though his lifelong love is ice cream, he still cranks out hit Hollywood movies, while also sharing his family’s award-winning ice cream with his cast and crew whenever he can. Check out Stratton’s past, present, and future work at IMDB! What other store locations do you have? Our flagship store is in downtown Savannah, Georgia, on historic Broughton Street and we hope you will visit us soon! In June of 2017 we opened a kiosk on the concourse of the Savannah/Hilton Head International Airport. In September of the same year, we opened an additional shop at the airport before TSA security. This location is open to the public (no need to buy an airline ticket for a scoop of ice cream!) and validates parking for all customers. Of course, we have our eyes on additional expansion in the near future. Please sign up for our mailing list so that you can be among the first to know when our next exciting development is here. Can your ice cream be purchased wholesale? Leopold’s Ice Cream is a super-premium product that helps make any dessert even better. We currently partner with a very select group of Savannah’s finest restaurants and shops to serve some of our classic and custom flavors. We recently expanded our reach with a partnership in Florida. We look forward to more of these wonderful partnerships in the near future. To see if Leopold’s Ice Cream is right for your business, please contact us at info@leopoldsicecream.com and a member of the Leopold’s team will contact you to chat. We’re glad you asked! Click here for more information. We welcome groups but do ask that you give us a head’s up that you will be visiting. 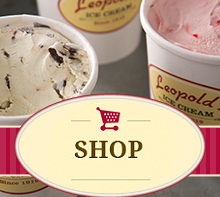 Send a note to info@leopoldsicecream.com so that a member of the Leopold’s team can contact you to chat. Do you offer coupons to groups? As much as we appreciate all of the wonderful groups that come to Savannah and visit our shop, we simply cannot offer discounts to each one. We do sell group vouchers and love creative ideas. If you are interested in more information, please email info@leopoldsicecream.com so that a member of the Leopold’s team can contact you to chat. Do you have anything special for Girl Scouts? Leopold’s Loves Girl Scouts! Click here for more information. Do you have any gluten free ice cream? All of our ice cream, with the exception of flavors that include cookies, is indeed gluten free. If you cannot have gluten, ask for a manager when you come to visit and let them know that you cannot have gluten. They will steer you clear of any flavors with gluten and can also scoop with a freshly washed scoop from an unopened tub to avoid any cross contamination. We do need to inform you that we use the same equipment to make all our frozen products. Did you invent Tutti Frutti? Yes we did! The three Leopold brothers created the now famous flavor back in 1919. We still use the exact same recipe to make our Tutti Frutti ice cream today! Do you have any vegan ice cream? YES! We recently developed (with the help of an amazing chef from The Fox & Fig Cafe!) a super creamy Vegan Vanilla made with coconut cream. Also, all of our sorbets are vegan. Does your ice cream contain eggs? Yes, all of our ice cream contains eggs. However our sorbets are egg free. We do need to inform you that we use the same equipment to make all our frozen products. Why don’t you have any sugar free ice cream? We haven’t quite perfected a sugar free ice cream yet. Until it’s perfect we won’t serve it to you. Do you sell your pints in grocery stores? Not at this time but we do have hand-packed pints ready and waiting for you in our shop. Just come in, grab the pints you want from the pint freezer and head straight to the register. No waiting in line! If we don’t have the flavor you want, just let us know. We’re happy to pack some up for you! Do you make anything besides ice cream? We sure do! We bake our own cookies, make our own toppings, roast our own meats, use fresh local shrimp and make all of our own specialty salads and soups in house, daily with love.